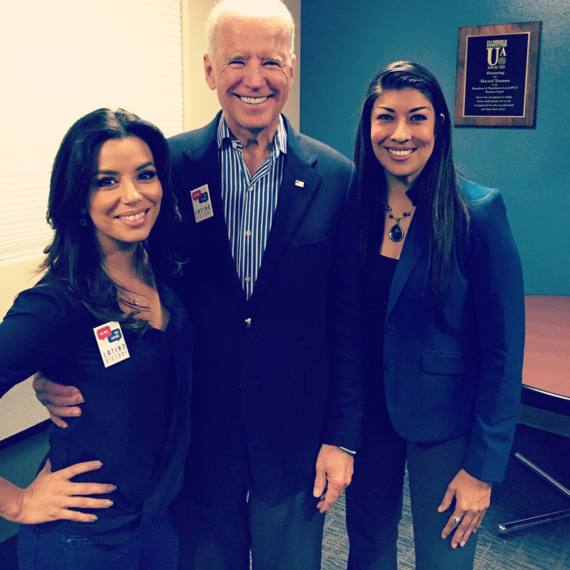 “…as a young Latina in politics, I had gotten used to feeling like an outsider in rooms dominated by white men. But I had never experienced anything so blatantly inappropriate and unnerving before. Biden was the second-most powerful man in the country and, arguably, one of the most powerful men in the world. He was there to promote me as the right person for the lieutenant governor job. Instead, he made me feel uneasy, gross, and confused. The vice-president of the United States of America had just touched me in an intimate way reserved for close friends, family, or romantic partners — and I felt powerless to do anything about it. Our strange interaction happened during a pivotal moment in my political career. I’d spent months raising money, talking to voters, and securing endorsements. Biden came to Nevada to speak to my leadership and my potential to be second-in-command — an important role he knew firsthand. But he stopped treating me like a peer the moment he touched me. Even if his behavior wasn’t violent or sexual, it was demeaning and disrespectful. I wasn’t attending the rally as his mentee or even his friend; I was there as the most qualified person for the job. Imagine you’re at work and a male colleague who you have no personal relationship with approaches you from behind, smells your hair, and kisses you on the head. Now imagine it’s the CEO of the company. If Biden and I worked together in a traditional office, I would have complained to the HR department, but on the campaign trail, there’s no clear path for what to do when a powerful man crosses the line. In politics, you shrug it off, smile for the cameras, and get back to the task of trying to win your race. After the event, I told a few of my staff what happened. We all talked about the inexplicable weirdness of what he did, but I didn’t plan on telling anyone else. I didn’t have the language or the outlet to talk about what happened. Who do you tell? What do you say? Is it enough of a transgression if a man touches and kisses you without consent, but doesn’t rise to the level of what most people consider sexual assault? I did what most women do, and moved on with my life and my work. Time passed and pictures started to surface of Vice-President Biden getting uncomfortably close with women and young girls. Biden nuzzling the neck of the Defense secretary’s wife; Biden kissing a senator’s wife on the lips; Biden whispering in women’s ears; Biden snuggling female constituents. I saw obvious discomfort in the women’s faces, and Biden, I’m sure, never thought twice about how it made them feel. I knew I couldn’t say anything publicly about what those pictures surfaced for me; my anger and my resentment grew. You don’t have to go far to see the problem with American’s federal regulatory health agencies. It’s a huge problem. I am reminded of more than a dozen scientists from within the CDC who put out an anonymous public statement detailing the influence corporations have on government policies. They were referred to as the Spider Papers. There are literally so many examples it’s ridiculous that agencies like the CDC and FDA are even allowed to operate the way they are currently operating. They control the entire medical industry, and everything in health, including medical education, is made and designed by these rogue interests…. During the past year, especially in recent months, the fear-mongering spewing forth from the CDC has become virulent. It is a classic Orwellian script. The recent measles outbreak – although nowhere near as alarming as the flare-ups of bygone eras – has been seized upon as an opportunity to brainwash the public and reshape it into obedient livestock in order to increase vaccination compliance. Worse, this disinformation campaign ignores everything we know about measles infection and the failures of the MMR vaccine. Unfortunately, we are no longer permitted to debate the pros and cons of the measles vaccine. The CDC consistently shuts down debate when its decisions are challenged. Physicians, medical researchers, immunologists and former vaccine advocates who challenge the loose claims for vaccine safety and efficacy are frustrated and eager to publicly debate the best vaccine advocates the CDC and vaccine industry have to offer, but none will take up the challenge because the science is so clearly not on their side. What you will never hear in the mainstream media is that there is another medical institution that is supposed to have been granted the responsibility to assure the CDC receives quality and reliable scientific research to use as the basis for its healthcare decisions. The Institutes of Medicine (IOM) does not possess the CDC’s legislative clout; however, it represents a far superior body of scientists and researchers in their medical fields. Founded in 1970, the Institute of Medicine falls under the charter of the National Academy of Sciences started by President Abraham Lincoln and Congress in 1863. The Academy was founded for the purpose of bringing together the nation’s best scientific minds to advise the government on scientific matters. The IOM was founded later to provide expert advice and reliable medical research to the White House and Congressional legislators to guide their decisions, keeping them informed about the social, economic and political impacts of healthcare. According to its principles, and unlike the CDC, IOM members deliberating on vaccine research and policies are expected to be independent and not represent private interests. During a press conference this month at Yale University, Children’s Health Defense founder Robert Kennedy Jr presented data (watch video below) from his investigations into the CDC’s culture of medical negligence and efforts to cover up of the compelling evidence for vaccine-induced injuries, including autism. Over the course of twenty years, the IOM has monitored and reviewed the medical literature to determine the most- and least- likely injuries associated with specific vaccines and provided recommendations to the CDC. In 1991, 22 illnesses were identified, 6 were confirmed as vaccine-related and 12 remained uncertain due to insufficiently reliable studies. Those cases with confirmed causation included learning disabilities, attention deficit disorder, and childhood diabetes. This data was collected subsequent to President Ronald Reagan signing the National Vaccine Injury Compensation Act, a point when autism rates started to climb exponentially. Three years later, the IOM identified 54 medical conditions, the medical literature supported 10 diseases as vaccine-induced and 38 were uncertain. Among the confirmed illnesses were seizures, demyelinating disease, sterility, transverse myelitis and, for the first time, Sudden Infant Death Syndrome (SIDS). Again in 2011, the IOM reported a whopping 155 adverse conditions with 16 vaccine-induced injuries supported by the science, including a correlation between the DTaP vaccine and autism. Unfortunately, the IOM holds no official authority over our federal agencies; consequently, its recommendations to the CDC to further investigate vaccines’ adverse effects went unheeded. Today, nothing has changed at the CDC. Instead, the agency has dug itself into a deeper hole of secrecy and corruption. With a budget of $11.5 billion, Kennedy notes that only a pathetic $20 million is designated for vaccine safety. The CDC is crying out for a thorough public audit. These early IOM reports are extremely valuable. They identify many of the same childhood diseases that have grown to epidemic proportions in the intervening years, and they indict vaccines as a causal factor. Yet regrettably, the IOM has recently showed signs of becoming as compromised as other health agencies. It, too, may have become another pawn of the Medical Deep State that is infiltrating every state legislative body to pass draconian immunization laws with the end goal of vaccinating Americans by lies and even threats and force if necessary…. (Natural News) The appendix has traditionally been considered a vestigial organ – a useless, evolutionary relic that sometimes turns life-threatening when it becomes severely inflamed, seemingly for no reason. But over the past several years, scientists have been amassing a compelling case that the appendix is actually a critical immune organ and that one of its primary functions is the maintenance of healthy colonies of beneficial bacteria in the gut. The evidence for this hypothesis has been strengthened by a new study conducted by researchers from Midwestern University, Duke University, the University of Stellenbosch in South Africa and the National Museum of Natural History in France, and published in the journal Comptes Rendus Palevol. The researchers have previously suggested that the appendix might actually be an immune organ. Scientists from Duke synthesized the findings of a decade of research to suggest the “safe house hypothesis” – that the appendix might function as a repository, or safe house, for beneficial bacteria to protect them from being completely eliminated in a bout of severe diarrhea…. www.XrayUltra.com – This documentary details the pizzagate scandal which erupted during the final weeks of the 2016 U.S. presidential election. #KILLROOM starts with the Podesta email leaks and gives one of the best, most concise run-downs of the evidence pointing towards an elite child trafficking ring. The Clinton campaign, DynCorp, and many more are implicated in this conspiracy. Viewer discretion is advised. Yet, as Poitras pointed out, the research department accounted for a minuscule 1.5 percent of First Look Media’s budget. Greenwald’s claim that the archive was shuttered owing to its high cost to the company is also greatly undermined by the fact that he, along with several other Intercept employees — Reed and Scahill among them — receive massive salaries that dwarf those of journalists working for similar nonprofit publications…. “The settlement resolves allegations that between 2006 and 2018, Duke knowingly submitted and caused to be submitted claims to the NIH and to the EPA that contained falsified or fabricated data or statements in thirty (30) grants, causing the NIH and EPA to pay out grants funds they otherwise would not have,” the release states…. What can I tell you? Cubans always speak of defending The Revolution. I speak of defending ourselves from the grief and hearbreak of being accomplices to evil acts done in our name and with our hardearned cash. I speak of defending our right not to be murderers. If I would rather die myself than run over a child in the street, how can I possibly accept squashing a million children from forty-five thousand feet? And to celebrate such a feat, I assure you, is quite impossible. To see the anti-abortion forces, including Bush, rage against poor and scared women, some of them homeless, who refuse to give life to a child they cannot support, while not even planting symbolic crosses for the actual children bombed to death in Iraq, is to witness cynicism in its most unconscionable form. I speak of defending our right to praise and uphold what is good about any other people’s way of life, even as we recognise and criticize what is bad. … I speak of defending the Earth, our Mother God. I speak of defending and loving the Earth’s children: All of us. LAX Shooting Another False Flag? ?